We have no more news on when the Panasonic S1 and S1R mirrorless cameras will actually come onto the market - or when we will get the full specification. But we did spot the Panasonic S1 in the flesh today, at a public exhibition, fitted with a 70-200mm. Admittedly it was in a glass case – so no chance of us getting a proper look and feel. But this was obviously a much more finished version that the S1R that we saw and handled at the original launch back in September at Photokina. The S1 was on display at the SWPP show at the Novotel West London in Hammersmith, London – which runs until Saturday. We fully expect the cameras to go on sale in March, following a recent update at CES. 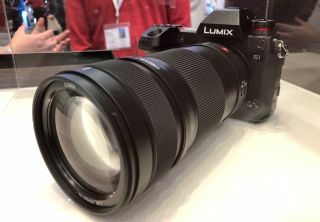 The mirrorless full frame camera was fitted with what looked a finished version of the 70-200mm lens which is expected to be launched with the two cameras. Black tape had been carefully positioned so that you could not see the stated maximum aperture of the lens. However from its size and 77mm front filter thread, it look almost certainly to be a 70-200mm f/2.8. You can also clearly see that the closest focusing distance of the lens is 0.92m (3.02 ft). The new cameras use the L-mount – which will be supported by lenses from Leica, Sigma, and Panasonic. Panasonic has said it will have three lenses ready at launch - this 70-200mm, a 50mm f/1.4 and a 25-105mm.